Previously, I described a problem with unmatched elemental magnesium and tungsten cylindrical samples. I decided to machine a precise cylinder in my home machine shop. Although I wanted to refine it down from a slightly larger rod, all I could find was a 99.9% pure magnesium metal ingot on eBay. Cylinder machined from large magnesium cast ingot. Above, you can see how much material was wasted in transforming a section of the magnesium ingot. Still, plenty remains of the block to make lightweight robot parts. 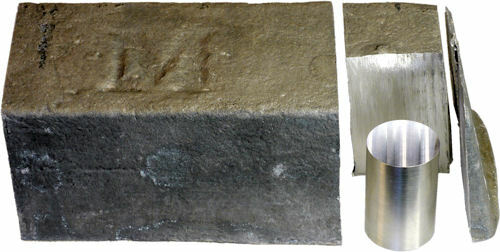 Elemental magnesium is used in firestarters and fireworks. That should be a clue to the dangers of working with magnesium. You should be even more concerned when you learn that you can’t put out a magnesium fire with CO2 or water. The oxygen in those compounds just makes the fire worse! Instead, a smothering agent, like sand or clay cat litter, can isolate the magnesium from atmospheric oxygen. In the event of smoke, how prepared and comfortable are you with pouring sand onto your milling machine or lathe? Whole warehouses and factories have burned to the ground from fires that started with scrap magnesium. The key is to remove magnesium chips and dust to avoid having a fire start in the first place. Blocks of solid magnesium are unlikely to ignite, except from a heat source (lighter, heat gun, blowtorch, etc) that is equally dangerous around other household materials. The first step is to roughly remove a chunk of the magnesium ingot. Since I still don’t own a metal band saw, I used an ordinary hacksaw. Cutting down block using a hacksaw. 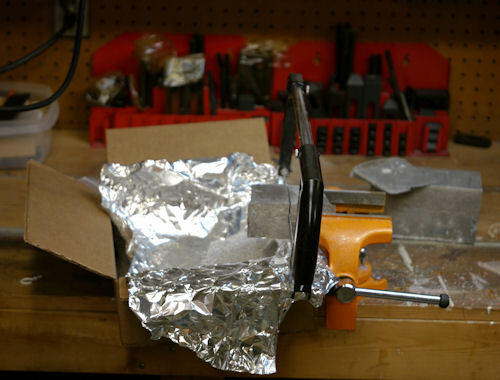 A box lined with aluminum foil catches the magnesium dust and particles, to avoid contaminating the workspace. Since this was the first time I machined magnesium, I liked the sense of manual control I had over the cutting, as opposed to using a power tool. I could feel that the blade and ingot were not heating up. After cutting, the remainder of the ingot was put away. The dust was taken outside and burned in a fire pit far away from buildings and combustibles, no different than starting a campfire with a magnesium flint. Although I suppose small amounts of magnesium are no more dangerous than recycled paper, I didn’t want it in my household trashcan. 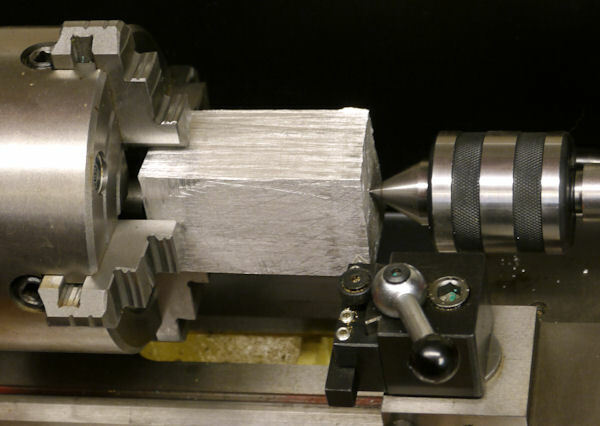 Next, the magnesium block was mounted into a vise on a milling machine to produce one flat side. This step was probably not necessary, except that the hacksaw cut was pretty rough, and I wanted to be sure it would mount in the lathe without being too far askew. Additionally, I wanted to get a sense for how magnesium machines on a mill. Machining a flat side of a magnesium block on a milling machine. Once again, the chips are collected into aluminum foil, dumped into a fire pit, and burned. Normally, I use a shop vac, but I didn’t like the idea of having magnesium dust embedded into the paper air filter. An overabundance of caution, I know. 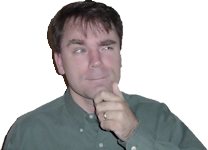 You try explaining to your wife and the fire marshal exactly how you burned down the house. Next, the magnesium is mounted into a large four-jaw chunk on a lathe. If you feel that the workpiece is not suitably gripped by the chuck, you can return it to the milling machine to square up the sides. Magnesium block on 4 jaw chuck of MicroLux lathe. 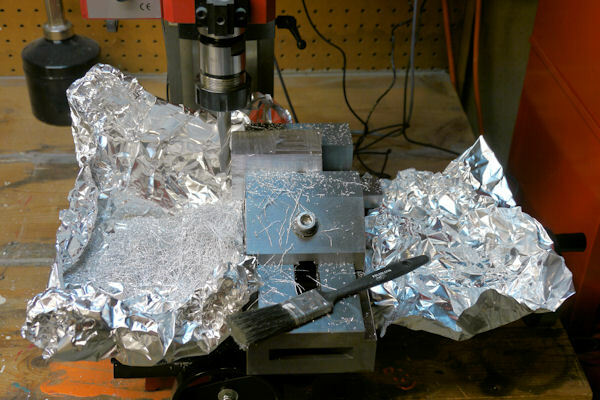 Notice again, the aluminum foil to collect the magnesium turnings. Magnesium block rough cut ready to machine to a cylinder. On the left side of the photo above, notice that the block isn’t completely flush against the back of the chunk. There’s an open space. An uneven gap is expected when the workpiece doesn’t have clean square edges. 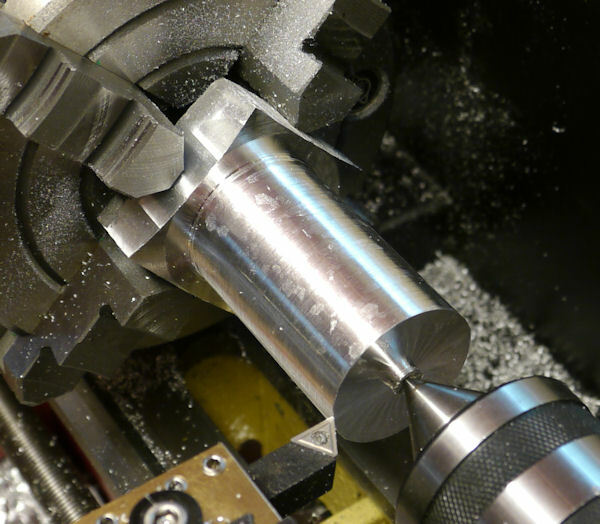 However, in this case, I was concerned that the workpiece wasn’t long enough to encompass the finished cylinder. So, I cheated by moving the block a bit farther forward. With each pass of the cutting tool, the block is gradually rounded over time. Rounding a cylinder from a block on a lathe. When the diameter of the cylinder was completely circular, I used a digital caliper to measure it. Gentler and gentler passes are made until the cylinder is just slightly larger than the finished size. Below, the nearly finished cylinder shows interesting patterns that appear to be crystals in the cast magnesium. Machined magnesium cylinder showing crystal boundaries before polishing. The residual magnesium turnings were removed from the lathe. Then, with increasingly finer grits of sandpaper, the surface of the cylinder is smoothed to remove tooling marks. The live center is removed to allow the open end to be faced flat. Finally, the cylinder is cut free from the base using a hacksaw. The desired length was cut on the milling machine using a v-slotted vise. Using the lathe would have been an equally good choice, except that my milling machine has a digital readout to precisely make the final cut. Because I collected the metal waste from each machining step, it provided a unique opportunity to document the different shapes and sizes of chips. The next page shows the photographs.